Denim miniskirt in mid blue. Fading and whiskering throughout. Mid-rise. Five-pocket styling. Belt loops at waistband. Logo patch in tan and pink at back waistband. Zip-fly. Logo-engraved silver-tone and copper-tone hardware. Contrast stitching in tan.Part of the Acne Studies Bla Konst collection. What’s the best thing about a mini skirt? How versatile they are! On Fashiola you can explore just how many different styles of mini skirts are available online. Whether you want your skirt to be tight, flowy, pleated, patterned, plain or have decorative detailing we are sure you’ll be able to find it here on Fashiola! 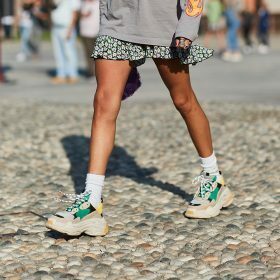 Styling a mini skirt is even easier – and it’s great that you’re able to wear them all year round – you can throw on a statement top or a casual sweater on with a mini skirt and you’re ready to go. So, are you ready to go?